Location: To S of Old Library, and Hayes Island snack bar. Built circa 1898, during re-arrangement of The Hayes and St John's churchyard areas following the extension of the Old Library. Underground public convenience. Single entrance with iron railings. Railings have leaf finials and a band of quatrefoils above a band of open quatrefoils, and lower intermediate railings with fleur-de-lys finials; taller posts have more elaborate fleur-de-lys finials; matching gate. Stairs down have brass handrails. Brick walls. Cubicles have dentil cornice, and 4-panelled doors. 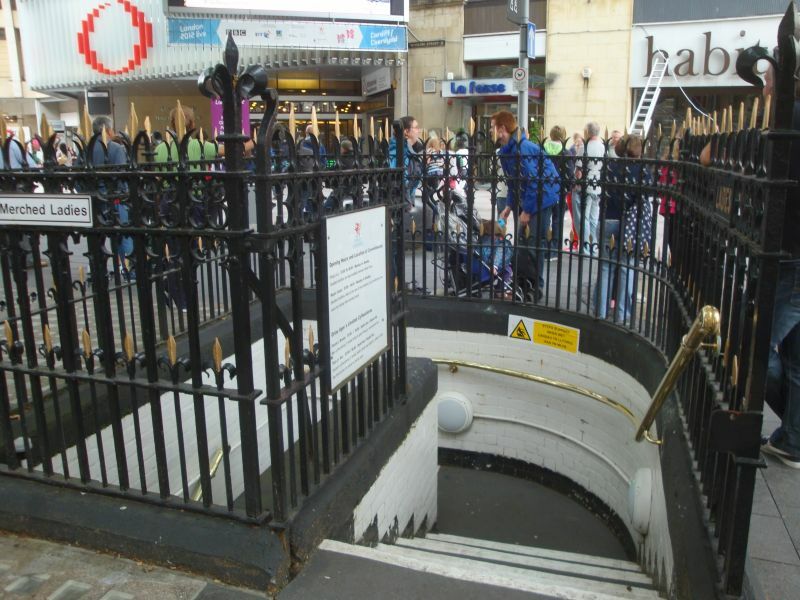 Listed as a rare well-preserved example of Victorian underground public convenience, with high-quality railings. Group value with other listed buildings at Hayes Island. At S entrance to Gentlemen's Toilets. To S of Old Library, near Hayes Island snack bar. Near SE corner of Old Library. Opposite entrance to Hills Street. At N entrance to Gentlemen's Toilets. On corner of The Hayes and Hill's Street. Occupying a key city centre location with entrance front to Trinity Street, dominant south facade to the Hayes, flank elevation to Working Street and rear facing St John's Church. Occupies most of W side of the Hayes to N of Tabernacle Chapel.